I drink a lot of tea in the winter. I drink my two cups of coffee in the morning and then the rest of my day is caffeine free usually. I am pretty sensitive to caffeine and if I drink any after lunch time it adversely affect my sleep that night. I really love my sleep so I have learned to avoid it after mornings. Caffeinated tea has the delightful effect of making me very very nauseated if I drink it hot, for some reason iced tea is fine, but hot caffeinated tea makes me want to vomit. Not sure why, so I avoid it, plus it has caffeine so I would avoid it after lunch anyway. 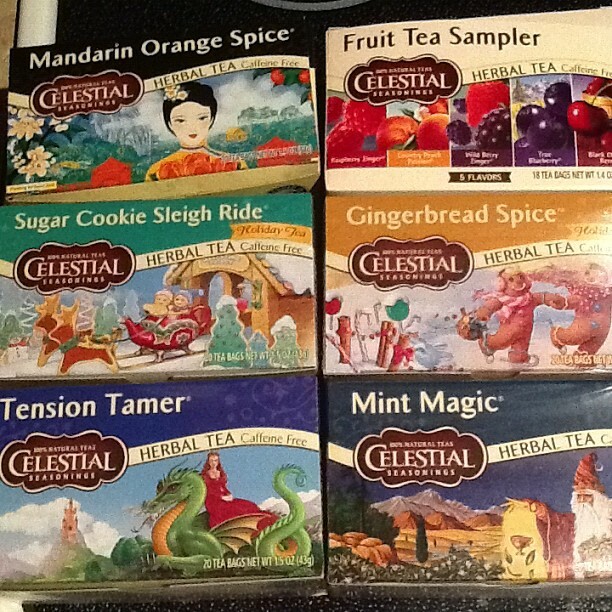 What I so really love when the weather is chilly in the afternoon and evenings is herbal tea and I think Celestial Seasonings makes the very best herbal teas. 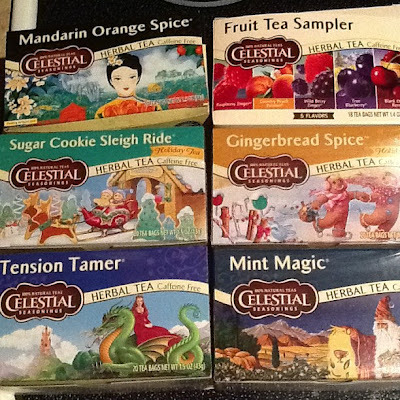 I think orange and mint teas are my favorite. I recently found Mint Magic and drink it by the gallon. This time of year they also have the holiday teas out the Gingerbread Spice with a little honey is pretty heavenly. 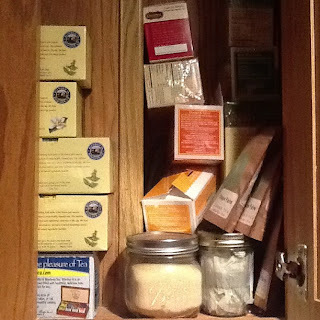 I seem to be really stocking up lately and noticed my tea cupboard over my stove was over flowing! The picture below is just half of the picture. Yesterday morning I had a crazy treat... time. My kids spent the night with my sister and my husband was out of town. So I sat at the table, read a book, drank my coffee and took time to enjoy the sunrise, which was crazy beautiful, a little frustrating the way pictures never really do it justice. Are you a tea drinker? Black, green, white, red, or herbal? I can drink a little green or white tea but mostly just avoid the caffeinated versions. I'm glad you got a little time to yourself this weekend:) I know what you mean about the treat of having some time to yourself. Sometimes it is almost surreal when I have those moments. I personally LOVE Good Earth Spiced tea, it is oh so yummy! You can get both caffeinated and decaf so you can enjoy it any time of day. I also love hot Spark in the mornings to get my day going because I think it is more beneficial than coffee, although I still LOVE the smell of coffee and will still indulge myself every once in a while. Sounds like you had a nice little break:) I don't drink tea, but sometimes when I am sick, I like to have raspberry or fruity tea with some honey to sooth my throat. It feels so good going down. Tea and reading at your table....that sounds like bliss to me. As I type this comment, I am surrounded by five-year-olds crowing for my attention. Celestial Seasonings is another reason for you to come and run the Bolder Boulder. We can go on the FREE tour and then visit the gift shop at their headquarters. I LOVE tea!! I usually get the Yogi teas or I like to drink Oregon Chai when I am not drinking coffee. I LOVE tea. 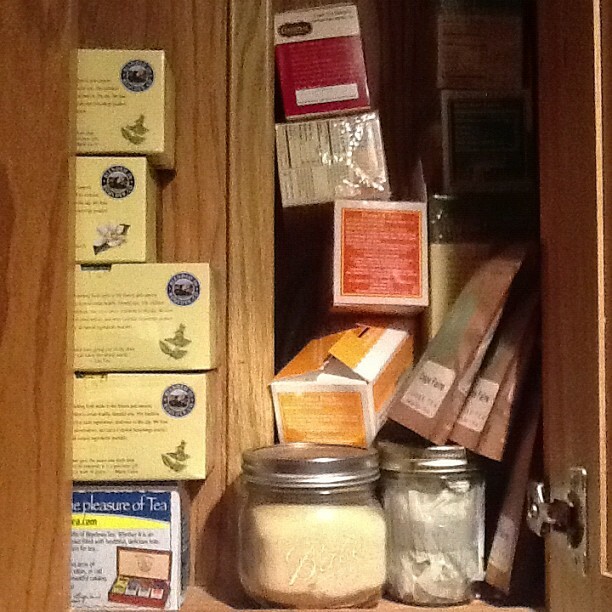 Mike and I buy tea in bulk and I'll drink like 8 cups a day. I usually drink green tea, but branch out for black or white tea occasionally as well. Your cupboard is seriously stocked! i have recently starting drinking green tea and love it. a dumb question though, is all tea calorie/sugar free? Because I love hearing from you all! Breathe Easy. It's really that Easy. Let's Go to the Beach in Alabama! Cauliflower Ham Waffles... Low carb and low fat too. Delicious! 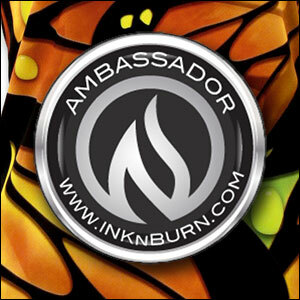 There's exposure in every run. 3 Tips to Make your Skin and Your Bathroom Ready for Fall! Chasing rain and slaying dragons! Beginning again... with a lot on my mind. My new favorite speed workout (*3*2*1*.5*) w/details and the best part of everyone’s day. 10 Year and Still Running! Shipyard Old Port Half Marathon (or) How Much Fun is that Other Portland? Sit for your job. Run for your life. Week 2 and a fast 5k! Friday Five and The Runners Choice Review! I won but didn't win anything (which is ok too). A Day In Our Life! CIM, did that really happen? Its 2015!!! Big Plans for the Year! The Journey is the Reward. Am I a runner....or just crazy? 2013 is on it's way.....how to heal a broken running spirit? and is there such a thing? ÜBER Excited About these Bars!! Facts about Afghanistan and Living the High Life! Running for Sanity: Mommy of 3 learning to run! one mile at a time. It's my Birthday! I will eat it if I want to. 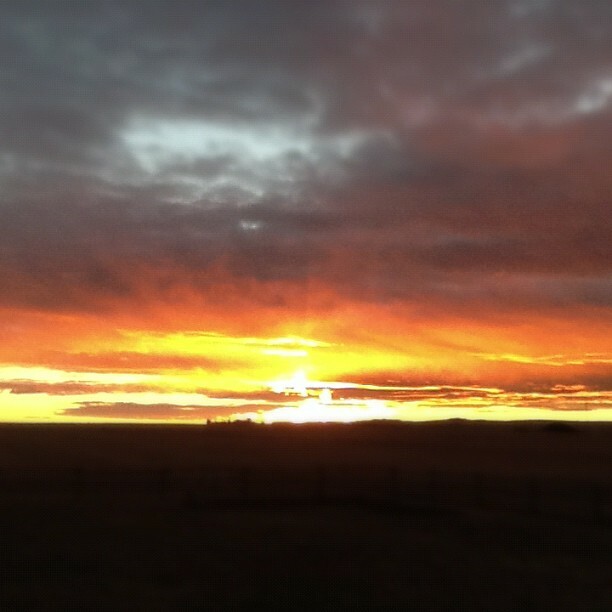 copyright christyruns.com. Picture Window theme. Theme images by konradlew. Powered by Blogger.